We love our new rug. The colors are true to the photos and it rolled out completely flat. Our roomba vacuums it easily with very little shedding after the second time. We get lots of compliments from friends and family. We have already recommended this product to others. Effortlessly capturing the charm of vintage Oriental motifs, this 8' x 10' rug from Safavieh's Evoke Collection is a marvel of modern artistry. This fashion-forward frieze rug features a grey field of color with shades of turquoise, royal blue, and ivory. A stunning display of elegance, this piece emulates the appeal of a rare heirloom. Beautiful rug! 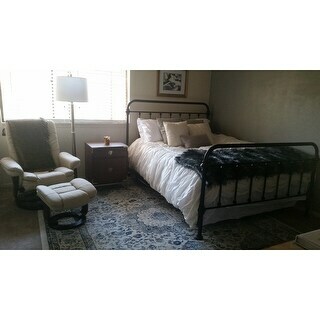 I purchased this 8x10 Safavieh Evoke Vintage Oriental Grey/Ivory rug to go in my bedroom, partially under my king-size bed. My bedroom walls are a medium blue with a lighter blue ceiling and white trim. 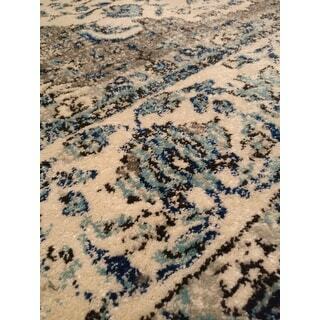 This rug has shades of grey, blue, and light ivory which blend perfectly with the other colors in the room. I put a fairly thick pad (about 1/2”) under this rug, which helped to create a softer feel when you walk on it. The rug is available in several sizes and I’m considering buying a runner to place in the hallway between the bedroom and bathroom. Since it helps to know where the review is coming from: I have a newer 4,000 square foot home and I like my furnishings to suit the house but I also know that my house is going to get lived in and rugs will get worn out. 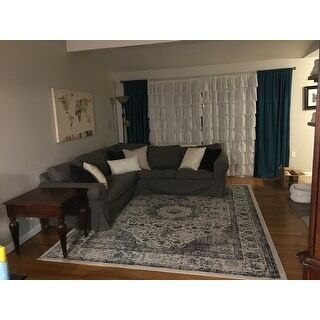 I don't want to spend a fortune on a rug in a high traffic area but I want it to look like good quality, not cheap. I have a couple of expensive wool rugs and this fits right in. It is thinner than my expensive rugs but you cannot tell without picking it up and inspecting it. If you sit on it, it feels soft and inviting. I also bought this rug in the light grey/ivory color. I love them both. You would never know that I paid $***. If you are used to paying $1,000 plus for a rug, this might feel thin to you but I don't think you'd be able to tell the difference unless you felt the thickness and compared. As far as people saying it was unraveling, one of the rugs had a loose string that I immediately cut off. No other problems and I would never complain about that because it is so inexpensive you cannot expect perfection. Definitely worth every penny. The colors are like they are online. It is very pretty in person. This rug, the Safavieh Evoke Vintage Oriental Gray/ Ivory Distressed Rug is perfect for the space I had available. I needed something to lightened up the room because of the color of the furniture. I love the color and it looks beautiful in the living room of my house. I actually have this rug on top of the rug on my floor and the color of the rug is light blue. I would highly recommend this color to anyone who is looking to lighten up a room. Just Beautiful!!!!! Beautiful rug! 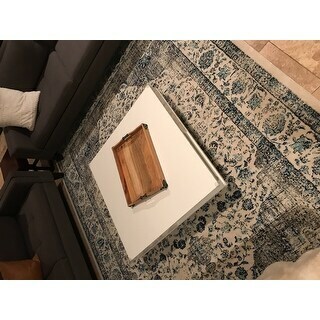 Bought it for our lving room, which is close to our dining room, where I used the Safavieh Evoke Vintage Oriental Ivory/Blue Distressed 8x10 rug. I was stressed about how they would look together, because I wanted a coordinated but not matching look, and they are both fabulous! 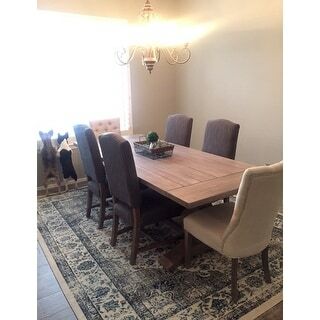 We had new flooring and wanted a rug that would be big enough to place under a dining room table. 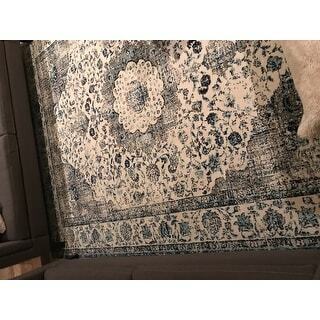 We purchased the Safavieh Evoke Vintage Oriental Grey / Ivory Distressed Rug (8’ x 10’). We ordered a non-slip pad at the same time, however felt the rug lay flat on the floor and would not be moving with the table on it. As you can see, there is plenty room for chairs to move on the rug. We have had it several months and continue to receive compliments. Love it! The rug looks just like the picture. The base color is ivory with grey and shades of blue. It looks great next to my dark grey sectional in the living room. It feels soft under feet and is easy to vacuum. There are creases in the rug from being rolled, but the creases have been coming out. I am also using a non-slip pad underneath the rug. I have 2 other Safavieh rugs and love them. High quality at a lower cost. I definitely recommend this rug! Perfect, softer than expected. No need for pad underneath on travertine floor. Colors grey, navy, ivory and teal. The teal is blended in background, I was concerned at first, then once rolled out cannot notice as much blends into back ground. Beautiful! 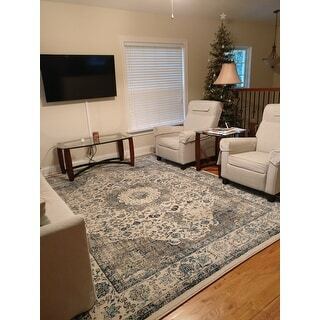 This is the third Safavieh rug I have ordered from Overstock and I have been extremely pleased with all of them. This rug is called "Grey / Ivory" and it's gorgeous and plush but be aware that there is not much grey in it. Mainly ivory with blue and teal. Looks great in my room with white/grey tile and grey walls. This rug is perfect for my dining room. The colors are ideal: good pop but not overwhelming. It picks ups all my grays, browns, and multiple accents of blues around my house perfectly. Good quality and comfortable on the feet. If it seems wrinkly, it will settle after a few days. It lays nice and I did not need a pad underneath it. The combination of navy, ivory, and turquoise is perfect for my livingroom. It is very pretty and plush to walk on, but not shaggy. The size couldn't have been better for separating an open living and dining space. It's beautiful and stands out in our room. It seems slightly more blue than photographed, but that worked to our benefit. And it's also a little more plush than the other Safavieh rugs I have -- once again, worked to my benefit. Love it! Of course, arrived in a flash. Thank you Overstock. You guys are the best! 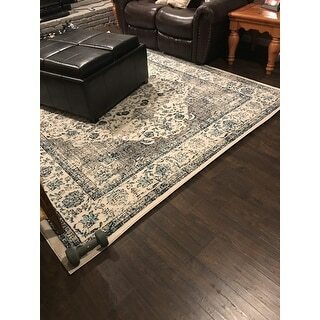 First purchase from overstock.com and I am very satisfied with the quality of the rug! Very easy to order and arrived quickly. I was surprised on the amount of blues in the rug and was expecting more gray (and hoping for more of a green-blue color) but I’m making it work! 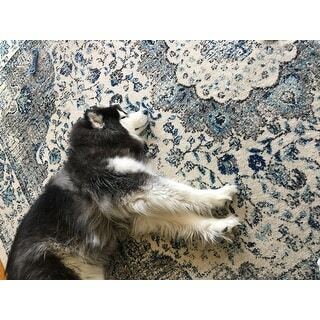 Rug is very soft and my dog loves it! A pretty rug, but the majority of the background is VERY bright white. Much more than the stock photos portray. We had to send it back. Great carpet at an affordable price. 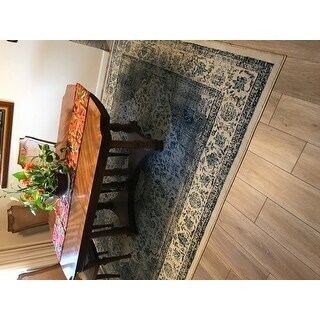 The rug I received seems a little more "distressed" then the picture but I like that and think it looks even more vintage. One of my favorite rugs! Love it! Looks beautiful in our home! Great rug for our living room. It's nice to walk on, and even though it's a light color, it doesn't get terribly dirty even though we have two dogs and two cats. I love the color, it is a light blue/gray/light cream, accurate to the picture. It's soft yet it's not a thick rug, hence easy to vacuum. It does have one stubborn corner that keeps curling up after months/1year of use. 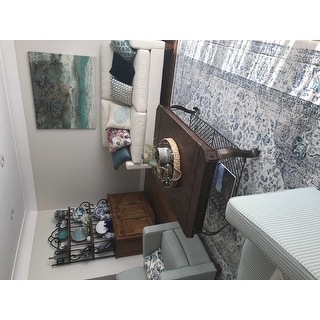 This area rug looks So good in the family room- the coloring is perfect!! I was a little hesitant buying sight unseen but it was great. The price was great so if the dog destroys I won’t stress!!! "Is this rug available in 5 x 7?" This rug is available in 5'1" x 7'6". Please note that sizes may vary up to a couple of inches. "Does the Safavieh Evoke Oriental Grey/Ivory Distressed Rug have matching rug runners?" "I have a King size bed and need to know what is the correct size to put a carpet under my bed. Not looking for totally under bed just under lower half.. Any info would be most Appreciated. Sincerely Carol "
This rug was beautiful on my iPad and color wise it was true to the picture. I needed it under a large dining room table and it is perfect. We just finished putting vinyl plank flooring in our bedroom and I think it would be the perfect size for under the bed. Under the table there is plenty of room to move the chairs back when you get up from the table. We have gotten many compliments on it. "Do you clean and repair rugs? 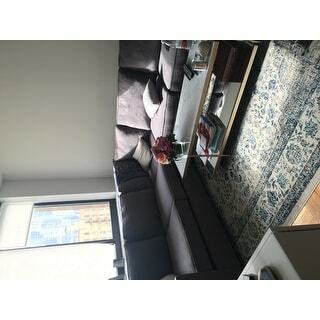 I have an all wool 6 foot round rug what would the expense be to clean it?" Unfortunately we don't offer this service. "Is this available in 12 x 15?" 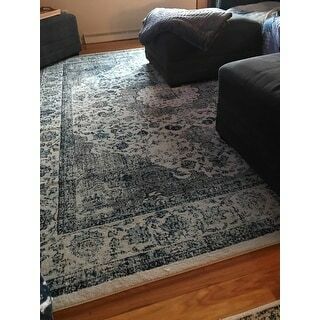 "My husband absolutely cannot stand the smell of this rug, I have used an entire box of baking powder and left it outside for over a week, I have also tried regular use of carpet cleaner over the course of two months and he says the smell still makes him sick, do you have any suggestions for getting rid of the chemical smell or any recourse for my purchase, he hates this rug purely for the smell." If smells persist for more than a few weeks, please contact customer service. "Obviously these rugs are pet friendly, but are they pet safe? Are they containing any chemical that could be harmful to their health? Some dogs lick carpets, would that be safe? Thank you!" I have two small dogs and 3 different sizes of this carpet. The carpet did not have any smell what so ever like installed carpet does. 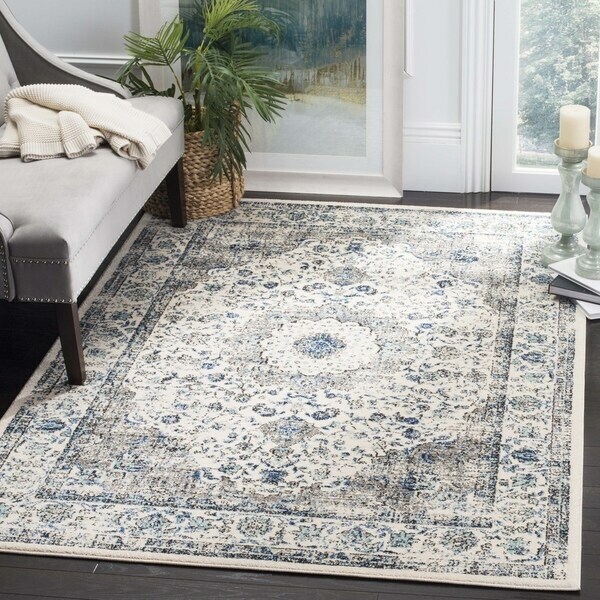 Safavieh Evoke Annabel Vintage Shabby Chic Grey / Blue/ Ivory Rug - 5'1" x 7'6"